and experience the sport of rock climbing. An empowering adventure delivering physical and mental stimulation with spiritual and emotional rewards. Rock climbing has become one of our nations fastest growing activities suitable for the entire family. So come join us and discover for yourself this magical kingdom of Joshua Tree. Joshua Tree Rock Climbing School & Guides since 1988 maintains the emphasis to create a safe, fun rock climbing or guided hiking experience in our nations most popular rock climbing mecca. Joshua Tree National Park is located in Southern California's Mojave/ Colorado deserts and is about two to three hours from Los Angeles, San Diego or Las Vegas and is only one hour from the Palm Springs area. Joshua Tree National Park is known for its stable weather, unique beauty, easy access and vast amounts of rock climbing. Joshua Tree Rock Climbing School & Guides offer outdoor rock climbing instruction, rock climbing lessons and climbing guides from two hour climbing lessons to multi day rock climbing classes, rock climbing courses and rock climbing seminars. From the beginner to the advanced rock climber or indoor rock climbing gym enthusiast looking to further their climbing skills. World class climbing in sunny Joshua Tree National Park, California with one of our friendly professional rock climbing guides is your avenue to a fun rock climbing adventure. Joshua Tree Rock Climbing School guides are the difference. They are among the most accomplished rock climbers in the world. Some of which for decades have trained our most elite military special forces. They are local rock climbing guides who take pride in their guiding professionalism and will make your safety their primary concern. It is clearly apparent in the way they approach each rock climbing lesson, rock climbing class, rock climbing course and rock climbing seminar of their expertise. The success of any rock climbing class, rock climbing lesson, rock climbing course or rock climbing seminar are the people, both the guests and the guides. Our climbing guides are the difference. Joshua Tree Rock Climbing School & Guides maintains the necessary licenses, permits and liability insurance to conduct and operate its outdoor rock climbing instruction, rock climbing adventure programs, Boy Scouts of America rock climbing merit badge certificates, rock climbing classes, rock climbing lessons, rock climbing courses, rock climbing seminars and private guiding within Joshua Tree National Park, California. 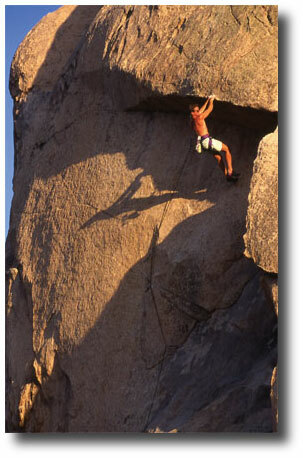 We are the oldest local rock climbimg guide service in Joshua Tree. Director and AMGA Certified Rock Climbing Guide.